Fifteen thousand men, women and children gathered in downtown Nashville on Saturday to walk in solidarity with the Women’s March on Washington — a march that, according to CNN, included more than one million people. Nashville’s mile-long march began on the John Seigenthaler Pedestrian Bridge, made its way through downtown and ended in the Public Square. Marchers gathered in the square to listen to speakers such as Zacnite Vargas, the Rev. Judy Cummings and others. Many Belmont students and faculty were among the 15,000, adding their voices to the crowd. Madison Peper, a Belmont junior, ran about two miles from her home to be a part of the march. “Even though it seems like I’m just one person in a thousands of person march, it’s fulfilling for everyone and really important to represent the people that you care about,” she said. Peper admired the diversity she saw represented in the march . “I’ve seen rights for immigrants and minorities and LGBT and women, which is awesome,” Peper said. Students attending the march had a wide variety of reasons for supporting the cause. Jonah Gillespie-Sickmen, a freshman at Belmont, marched to support women’s rights, as well as an array of other issues. He is concerned with racial inequality, the problems in the school systems, the wage gap and more. “It’s about time all these awesome ideas and things are supported and stood for,” said Gillespie-Sickmen. 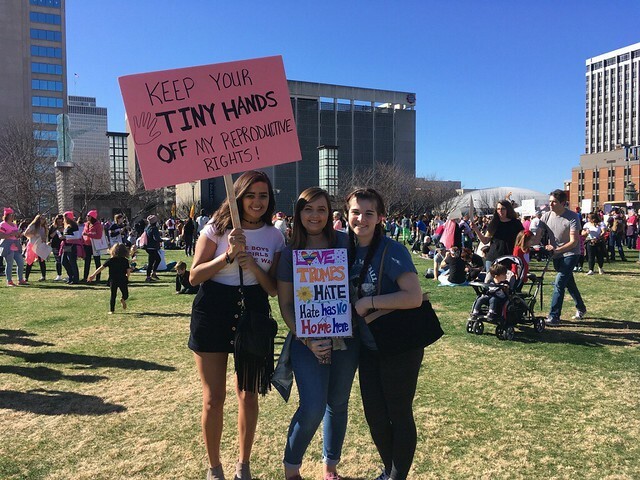 Belmont students and faculty came out of the Women’s March with feelings of positivity and solidarity, and, no matter what the reason, they joined the largest protest in U.S. history. Article and photos by Emily Allen. Students march to remember Dr. Martin Luther King Jr.